Winter is over and the next agricultural season is starting soon! So, we decided to look through the figures of the last year and share some interesting facts about Bazis Agro activities in 2018. 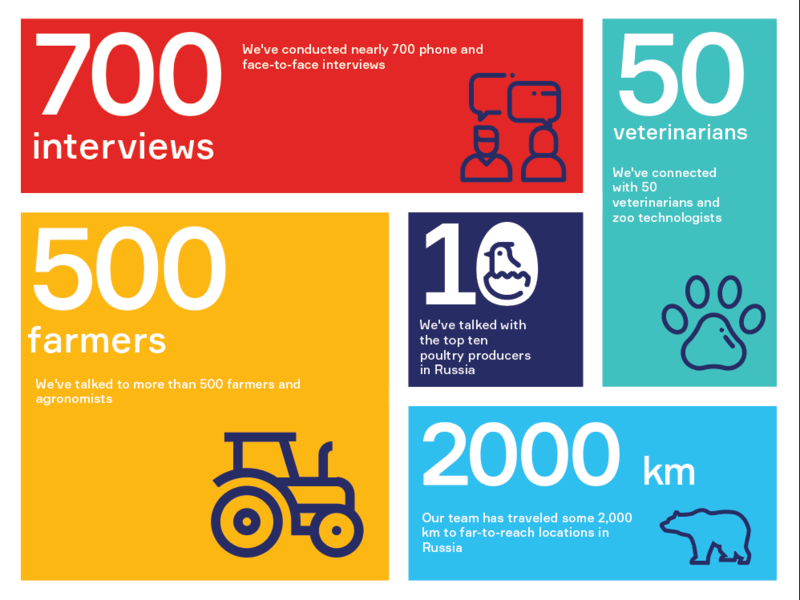 We have completed almost 700 phone and face-to-face interviews. Our interviewers travelled about 2,000 km trying to reach the farthest locations and ask respondents’ opinion about new communication campaigns. We covered over 20 agricultural regions of Russia and Ukraine. We were able to establish a dialog with the most competent specialists from the top ten poultry producers of Russia, as well as with the busiest agronomists from a wide range of farms, the smallest one having 500 ha, and the biggest one – 280,000 ha. Above all, Bazis continues its work on its annual Agro Tracker survey. This time, we are sending our previous wave report as a gift to industry insiders to see what insights you can get from 126 decision makers from different regions of Russia. If you would like to see the report or if you have any other questions, just send us an email and we will provide you with all necessary information.